Vista Montana seemed dated and didn't impress me. The overall feeling wasn't as good. I saw two rooms which looked OK, but didn't look as clean. The staff was polite and gave me a tour. They had Bingo. Vista Montana Senior Living is a very nice place, and the people who run it are wonderful. My mother gets her hair done, and she enjoys the company of a few people. They have a recreation room, a movie room, a library, places for them to get together for Bible studies and meetings, and have games they play. One day I was there, they came and got my mom for Christmas carols. The girls come around to the rooms and try to get the people involved whether it's singing or playing bingo, and she has gone to a few of them. She complains about the food, but when people are old, they don't know what tastes good anymore. I sat in the dining room with her on a Saturday, and I tasted her food. I thought it all tasted very good, but she thinks it's too salty. They're doing a good job. I love the staff. The facility always looks clean and nice. I am a caregiver for a friend that has lived at Vista Montana for the past 6 months. I visit this assisted living facility very frequently and each time I find the staff extremely attentive. The facility is extremely clean, has attentive medication assistance and offers an array of activities for the residents to keep them active. Prior to coming to Vista Montana in Hemet my friend was at a similar facility in Long Beach which is owned by the same company which was also very good. My complements to the staff at Vista Montana. Please keep up the good work! Vista Montana and its staff are nice. We like it. The room is average, but nice, clean, and doesn't have carpeting, which I like. The people I met are very nice, genuine, and treat my mom really well, which is really important. My mom very much enjoys the staff. She says they're very kind, nice, courteous people. Vista Montana was OK and clean but didn't have a modern look. Location wise, it was OK and outside of the busy area. It could use some modernization. The downside was the dining area; they had so many people there and a small dining area had to be run in shifts to feed all of the residents. I saw a set menu, and they do a different menu each day, but they had one or two choices, and that was about it. The staff was good and knowledgeable. Vista Montana Senior Living was nice. They were friendly, but it was not as nice or accommodating. The area where the residents have their meals was not as fancy. It was nice though. The rooms were too close to each other. Vista Montana Senior Living was a little bit far from my home. Vista Montana is an afgirdable, well maintained, clean, comfortable facility. My family recently had need of an independent living situation and we found Vista Montana. We immediately felt the care and compassion of staff and the management. These people go the extra mile to care for and about each resident. If I should ever need independent or assisted living, I would live there. We Had lunch in the dining room with our family member there a couple of weeks ago and Yum Yum! Thank you to everyone there for your kind hearts and compassion. My visit to Vista Montana was good. The place is very nice, and my grandmother has been living there for 2 ½ months. The assisted living place is very nice and very clean. My mother in-law was placed at Vista Montana and I can honestly say that it is a wonderful place to live in. She was well taken care of by the Caregivers, you can see their love and passion for seniors like our mom. The entire staff was awesome. They all treated us with respect and cared for our needs when our dearest mother was on her journey to meet her creator. I would recommend this place for anybody who need a place for their love one..
Vista Montana Senior Living was a nice place, and I liked it. Everyone and the rooms were real nice. It had pretty much everything that we wanted. They provided three meals a day and snacks in between. They had cards, bingo, and different activities to keep their memory sharp. We chose Vista Montana Senior Living for my mother-in-law because of the cost, cleanliness, and the look of the overall facility. So far, the staff is very nice and the amenities seem to be good. They have multiple game/meeting rooms and activities for the residents. The dining area is nice, and they serve three meals and snacks every day. Mom's room is small, unfortunately. The staff at Vista Montana Senior Living was pretty friendly. They were in the process of doing some remodeling, but the areas that we saw were very neat and very clean. They had a nice-sized dining room. The only drawback there was we didn't see too many of the residents. There were a couple of the residents in the TV room who were both asleep on a chair and couch. It seemed like there wasn't very much going on. The staff was very friendly and very informative. We visited Vista Montana, and they're trying to make it work, but I had to walk through rugs that were stained in common rooms, which was very depressing. There was a whole depressed, dark feeling about the place. Even the manager tried to do a good job of showing me around, and it just did not work at all. We visited Vista Montana and really liked the place. It’s a newer facility that looked nice and clean. The accommodations and dining room looked nice. Overall, it’s a good place. The staff was excellent. I visited The Montana (Vista Montana Senior Living). They didn’t have a lot of people there because it had recently been purchased. There was a gal who dis the activities and a very nice dining room. I think I saw about six people on staff, so I think that they would need more. The dining area was very pleasant. They had done a lot of remodeling of new tiles and new flooring. They put two people in a room, which worries me because the rooms aren’t big. You have to have your own bed and dresser. My great aunt moved in here a few months ago and my family went to see her on Easter. I was pleasantly surprised by the modern decor and oasis-like feel of the courtyard. We even brought our dog who loved romping around the grass and getting fed treats by the other residents. The staff members were all really nice and friendly. Her room is on the ground floor and has a nice new bathroom and a french door out to a yard where she takes walks every night. I would definitely recommend this facility if you are looking for a place to stay in the area. The manager that took me on the tour at Vista Montana was very friendly. The place is clean but old, probably 20-30 years old. He showed me an apartment that they were modeling, and it was going to be nice. For what they charge, it was nice. There was a nice, clean dining room. They have a craft room with a lot of puzzles and a lot of activity for the people. The older people get to make things, and once a year they have a sale. They had a piano and a big viewing room for the TV. They had an elevator for the people with walkers. Vista Montana Senior Living was terrible assisted and independent living. The staff took us to a studio apartment in the independent side. It had a small area with a sink and some cabinets, and I found it depressing. She said all their rooms were like that. We didn't look at any of their amenities. I didn't like the location. It's in a busier area of Hemet where a lot of small businesses were. The lady who took us on the tour was nice. They were extremely busy there. The assisted living and the independent living are two separate buildings, but they're connected and it seemed to me like people were running back and forth between the two buildings. There were some people there visiting in the assisted living. It looked clean enough as far as we could tell. The grounds were reasonably kept, but they didn't have much in the way of grounds. It was taken up by the parking area. I was not impressed. Vista Montana was clean and well equipped, but there seemed to be some questions if they could do the level of care that my friend would require. Nevertheless, the staff members were helpful, courteous, and knowledgeable. The location was convenient. The rooms were clean, well maintained, and adequate. Vista Montana was very warm and welcoming. and they do a good job with maintenance and cleaning. The seniors looked happy and seemed to be doing OK. It looked clean and good environment, but it was too much money at this point. The apartment was too small; it wasn’t enough for two people. The staff did a great job giving me the tour and explaining to me, and he took me all around the area. It was a good tour. Vista Montana Senior Living was an older building but still nice. The staff was accommodating and would take care of you. They had small rooms, but they would maintain them for you if you wanted. I ate there, and the food was good. They had a very big dining area. 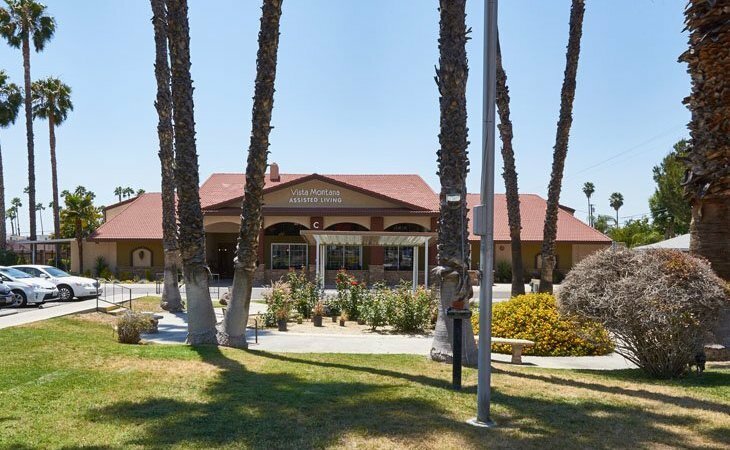 Vista Montana Senior Living is a new renovated Assisted Living as well as Independent Living community located in Hemet, CA. We cater to those are looking for a comfortable and casual atmosphere to enjoy living life. What should caregivers and potential residents know about Vista Montana Senior Living?